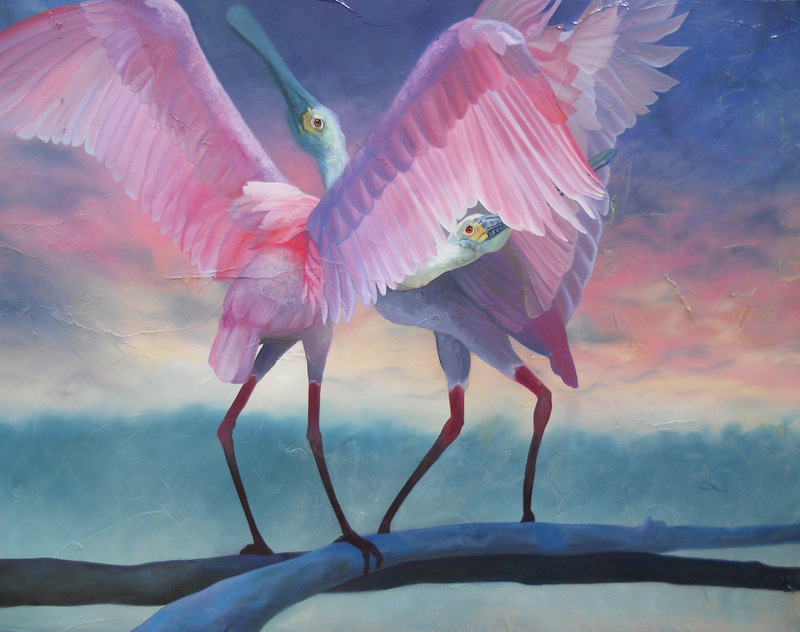 Talk about a conversation starter, this spoonbill original oil on canvas wildlife bird art featuring two roseate spoonbills will be the new favorite of your artwork collection. Enjoy brilliance of color, texture, and beautiful birds engaging in their own conversation. Let this artwork lift your mood with pink, purple, lilac and fuchsia as these private creatures say it all. This original wildlife art oil on canvas artwork displays two roseate spoonbills talking to each other as they balance on a branch. Enjoy hues of pink, purple, blue and citrus as a large focal art piece created with oil on canvas 48″ x 36″ that will bring vibrancy to your original artwork collection. Whether just starting your art collection or looking to add a new beauty to your your current collection, the “Private Chatter” one-of-a-kind artist signed original is available to purchase below. Appreciate this artist crafted, detailed, oil on canvas original artwork in your own home. “Private Chatter” brings an incomparable charm that can bring some of the elements of nature indoors. Whether adding a sense of escape to the office, enriching the home, or adding some extra flavor to that special vacation retreat, your new artist signed giclee can even more life to your interior space.